I say so because some of the most important developments in and around me and the best of the things happened to me this year. Waise i am a person who would love to live life in the best way possible and would never miss a chance to celebrate each moment! But this year has been exceptionally great and i loooooooooved every bit of it! 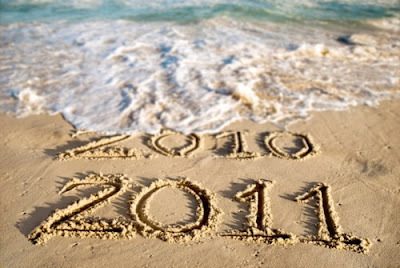 Now lemme take a recap of the year 2010 and say what was so great about this year that i regard it ' The Best year' of my life till date. January : I got married! :D So you know the main reason for me to love this year. * wink wink* The month was spent in shopping, shopping and more shopping! My wedding was on January 31st, so i had this whole month to indulge myself in the best. A south Indian family girl going to be a part of a North Indian family!! Such awesome times i had. April : Tra la laaaaaaaa!! My hubby comes back to India to stay with me for one whole month! :D More reasons to celebrate! We enjoyed in my hometown - Mangalore for a week. We spent a week in his hometown - Gujarat for a week. We went on a fun trip with my family to Munnar, kerala for a week. The rest of the days were spent in post wedding parties ! ;) A fun filled month! May: My birthday AND my hubby's birthday too! Since it was our first birthdays after marriage, we wanted to make it more special. We did celebrate it in the best ways possible showering each other with love, care and a whole lot of gifts! But unfortunately we could not be together for my birthday because he had to leave at the start of the month and my birthday was at the end of May! But nonetheless, he made sure he made my birthday reely special :) And now the tragic part of the month! :( I lost my dear friend in the Mangalore Plane crash :( She used to live next door and i had the keys of her apartment which i was waiting to give her on that fateful day. I will never forget that day :( May her soul rest in peace, that is all i can pray for now. June : My visa processing was going on and i started my experiences in the kitchen full time! Yeah, till now i was busy with college and friends so i used to just be the assistant cook in my kitchen. But now i started taking the main jobs ;) I have a passion for writing and i wanted a platform to record events of my life and my thoughts! So yeah, started blogging - http://naazuk.blogspot.com/. August : I started baking cakes! One thing which i always wanted to do. I baked so many cakes in August and September that i got tired of baking them but my siblings were not tired of eating! So i went on and on! September : Weddings, parties and get togethers. Caught up with school friends, college friends, MBA friends! October : A very important month for me this year! My parents left for the 40 day pilgrimage to Mecca also called Hajj. So i was handed over the position of the 'Top chef' at home as my mum was on the 40 day leave from the kitchen! I knew it was a big responsibility for me as i had two working brothers and 3 college going siblings, an aunt and my grandma! I had to please their taste buds throughout the 40 days! And Alhumdulillah, it turned out one super splendid month for all of at home! We all gained weight! LOL! Not that while my parents were around we were skinny creatures, but the amount of chicken, paneer, cheese, cakes, desserts, sandwiches and chaats that went into our tummies this month, we all bloated up! :p And not to forget my elder bro's birthday meal preparations! Just fabulous!